It's May 14, and it's snowing in Sakhalin. This is nothing unusual, though it's a pity, for the trees were about to blossom. There were jonquils outside my window, but now this tender new spring is sprinkled all over with cold whiteness. The news summaries are not any more cheerful: "a powerful cyclone with abundant snowfall has hit Sakhalin, which means the power is down in the centre of Yuzhnosakhalinsk and winter has returned to Sakhalin..." Nothing seems to captivate the attention of our central media more than this. The news summaries are not any more cheerful: "a powerful cyclone with abundant snowfall has hit Sakhalin, which means the power is down in the centre of Yuzhnosakhalinsk and winter has returned to Sakhalin..." Nothing seems to captivate the attention of our central media more than this. Sakhalin gets hit by a snowstorm and it's news on the national channels. But none of the local people are ever surprised by the fact that the TV screen always seems to show the same footage, filmed goodness knows where. As a provincial journalist, it's interesting to look at the work of my colleagues from the mainland. I must admit that Moscow for me is like Sakhalin for them. They still call Sakhalin a peninsula, and then go on to say that the latest cyclone has cut all connections between Sakhalin and the mainland. My co-editor's mother lives in Belarus. As soon as she sees these kinds of alarming weather reports on TV or the internet, she calls her daughter to ask what is going on. And what can we say in reply? The island is just having its usual weather. Until recently, Sakhalin seldom made it into the federal news at all except for its weather. It did hit the headlines in August 2007, when an earthquake almost completely destroyed the coastal town of Nevelsk, following which the island's governor was sacked and a new one appointed. Many Sakhalin residents were amused and surprised by the reasons the federal channels gave for the governor's dismissal. It's as if we were saying, so that's how it is! We didn't know - thank you for opening our eyes... But that's another conversation. When details of funds from the federal centre being sent to rebuild Nevelsk were given on the news, Sakhalin, in many Muscovites' minds, went back to being a place where bears roam the streets and people travel by reindeer, catch fish and speak a strange language. One of my mainland acquaintances once asked me to send him a colourful photo to give him an idea of where it was he was being sent on business. I tried my best not to disappoint him, which is not hard seeing that I have plenty of bears and reindeer in my photo archives. I don't want to try to change the picture others have inside their heads. For some people, this exotic picture of a distant place is perhaps precisely what will attract them to actually make the journey there and see it all with their own eyes. In fact, there's a grain of truth in this image. It is entirely possible to run across bears on the outskirts of our towns, especially in spring and early summer, when they are hungry. People feed them, feeling sorry for them, as if they were stray dogs. The bears lose their fear of people and start coming closer and closer to homes and yards. But this doesn't mean people stop being prey or bears hunters, so tragic incidents are unfortunately all too common. When people ask me to say a few words about my island (rather than just saying I live on Sakhalin, I like to say that I live on an island - it has something magical about it, I think), I tell them I love Sakhalin. It sounds banal, but it's the absolute truth. I love it for banal reasons too: the people are good and the landscape is beautiful. At the weekend we went up to Chekhov Peak, which at 1048 metres is the highest mountain in the southern part of the island. It was the seventh time I had been up, but I still found the views wonderful. Up there, far from the hot and dusty city, you can breathe so much more freely. The rounded hills spread out all around. We have a special word for these hills in the Far East - ‘sopki'. Say it to someone from elsewhere in Russia and they don't know what you're talking about. It's a local word. When you hear someone talking of ‘sopki' rather than hills and mountains, that's the mark of a true Sakhalin islander. Add to that things like ‘gathering water chestnuts, cooking with wild herbs, the ability to tie up winter fishing lines, tell a Korean from a Chinese or a Japanese, eat kuksu (Korean noodles), not wrinkle your nose at the smell of the Kamchatka bilberry, drive cars with the steering wheel on the right, use chopsticks, clean dried smelt and be able NOT to like red caviar.' This last one is probably a joke: in Yuzhnosakhalinsk caviar is almost more expensive than in Moscow, but I digress. This time, it was the whole town that set off for Chekhov Peak. In Yuzhnosakhalinsk, the capital of Sakhalin Region (not of Sakhalin, as my TV colleagues like to say), we have a tradition of climbing the peak in honour of Victory Day. The ascent this year was different in that students were entrusted with putting a replica of the Victory Banner at the top. This important mission was accomplished four hours after the ascent began. The whole trip up and down takes about eight hours. I like to climb the peak in spring. Everyone says it's not the best time because there is still a lot of snow. This is true. The snow remains on the slopes until mid-summer, but where the sun shines more strongly the snow has already melted and you can see the clearings where berries grow and the dense tangle of Siberian pine saplings. It looks like summer and winter all rolled into one. My friend says the landscapes are like those in the film ‘Lord of the Rings'. In short, it's beautiful. As for the people, provincials, especially distant ones like us, are always a bit different. I have no complexes about the fact that I'm 23 and for me the mainland is a big country, where I've never been. It's not the same as saying, ‘you know, I haven't been to the Moon yet'. I suppose because flying to the Moon is a dream, whereas going to the mainland is a real possibility. I'll let you into a secret: I plan to go to the mainland this summer, and not just for any old reason, but to go to a concert. The island's remoteness doesn't bother me. People say, ‘wow, cool!' when I tell them I live on Sakhalin. The only problem is that my favourite musicians don't come this far. If they've been here, it was before I became a fan. The ones who come now are all Russian pseudo pop stars, whose concerts are actually very popular. When the rock group ‘Nochniye snaipery' (Night snipers) came, their concert was not sold out, though rock music is quite popular here. It's the music all my friends, and I have quite a lot of them, listen to. So, I've found a very good reason for my first trip to the mainland - a concert. Sometimes I look at what's playing in Moscow and St Petersburg and can't help but feel jealous. I almost forgot another event that got Sakhalin into the news. The president came out here in February. It had been a long time since any presidents visited Sakhalin, and in such distinguished company too. With the president came the Japanese prime minister, the Duke of York, the Dutch minister of the economy and 100-odd other ministers, industrialists and businesspeople. Only Putin stayed behind. "Someone has to stay in the Kremlin, after all, to water the flowers". The delegation was so large and important that the city's airport was closed to ordinary passenger traffic that day. The main streets were closed to traffic and glum-looking policeman stood on literally every corner. They had to stand a long time. 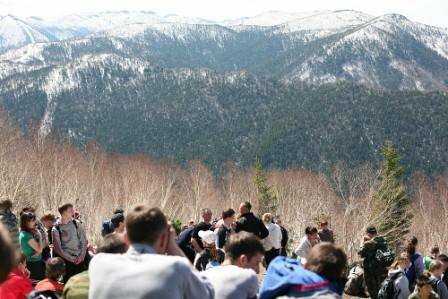 Dmitry Medvedev spent almost 24 hours on Sakhalin. Some said that the president is afraid of his own people - even shops selling weapons were closed that day. Safety first. The island had long since been expecting him. They tried to keep the date a secret, but it didn't work. People guessed that there had to be a reason for the abundance of snow-clearing equipment out on the city streets. The city authorities normally don't pay so much attention to clearing the streets. The city was literally buried under snow after the New Year holiday period. Even big cars had a hard time getting through the snowdrifts, not to mention pedestrians. But as soon as word got round the HE was coming, the equipment and workers got busy. Hundreds of KAMAZ trucks worked around the clock to remove all the snow. But a new ‘powerful cyclone with abundant snowfall' hit the island just before the big day. People worried that the airport would be closed and the important guests unable to fly in. However, as visitors later noted on one well-known Sakhalin forum, "Dmitry Medvedev is an excellent president. Yesterday we had a snowstorm, but the sun was shining as his plane arrived. He leaves on the 19th, and on the 20th the snowstorm will resume. Good people are always lucky. So, we should give him his due". Angry islanders took to the streets to protest the Kremlin's decision to increase import duty on foreign cars. But this was about the only time people used the words "excellent president" during his visit. Just the opposite: the islanders were unhappy with their president. It was just when Moscow was talking about raising import duties on second-hand imported cars. Like all people in the Far East, people on Sakhalin were in a state of complete shock over the decision. There are two cars for every one person on Sakhalin, and they are practically all Japanese. It's far from everyone who buys new foreign-made cars (there is a 24-fold income gap between the different layers of society on Sakhalin). Second hand cars make up the bulk of sales on the island. And then we suddenly get this news from Moscow. People on Sakhalin, as in Vladivostok, even took to the streets for an unauthorised meeting (not sanctioned by the authorities) calling for the duties to be abolished. We at Sakh.com were the only ones to cover the meeting, and ended up paying for our boldness. Other media contented themselves with the regional administration's terse press statement: "Far fewer people took part in the meeting than the organisers hoped for..." People joked that the President would arrive in a Russian-made car, but that was not to be. As for what brought the president all the way to Sakhalin, it was not a concert by his favourite musician of course, but an event for the whole country - the opening of Russia's first and only liquefied natural gas (LNG) plant. I too managed to be at the opening ceremony, not that I was overjoyed at the chance. There is not much fun to be had in catching a glimpse of the president in the distance and then following the endless statements on a big screen in the press service's office. Others were envious. "Cool, you'll see the president", they said. I said it'd have been better if Shakhrin, the leader of the rock group Chaif, had come. The best equipment and most advanced technology were used to build the gas installations in Aniva Bay. Sakhalin Natural Gas is a huge complex in Aniva Bay. It boasts the best specialists, the best equipment, and the most advanced technology and is the result of 10 years' work. The nature of my job means that I have been following the Sakhalin-2 project. I am familiar with all the stages of its implementation and have visited various sites, as well as going on board oil and gas tankers. I had an idea then of what the people directly involved in the project felt at the launch. This is their baby after all, as Ian Craig, director of Sakhalin Energy, the operator company, likes to say. But because I've been following the project closely, I also understand the local people's scepticism about offshore development, LNG production and royalties. They didn't build the plant, have seen it only in passing and, for most of them, LNG is something that gets sold for a lot of money to Japan, the USA and Korea. Oil and gas account for 95% of Sakhalin Region's exports. When Sakhalin-2 reaches full capacity it will provide 5% of the world's gas supplies. 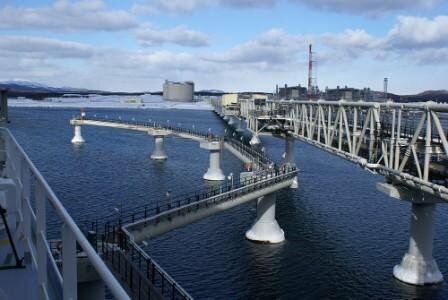 There are plans to deliver gas from Sakhalin throughout the neighbouring region of Vladivostok. Meanwhile, an old thermal electricity power station still chugs away in the south of our island, and there are plans to convert only one unit to gas by 2011. In response to this situation people joke that Sakhalin residents are asked: ‘We've got gas in our flat. Have you?' 'Do we have gas?' comes the reply, 'we've got the whole pipeline!" It's not surprising then that Yuzhnosakhalinsk residents are eager to get out of town, even if the weather is not very sunny. They're after a bit of fresh air, especially when you consider the two cars per resident as well... it's a good thing that there's nature just nearby. And it's beautiful. The old power plant is nothing when you consider that it took them until May 9 this year to find the gas to light the Eternal Flame - the sacred memorial to our victory in the war. In the past, they'd light the flame before the war veterans arrived at the monument, and then it'd go out until the next Victory Day came around. Now the local authorities promise that the Eternal Flame will be just that - eternal. Time will tell. The LNG plant was launched amidst big crowds and with much pomp and promise. Fireworks lit up the evening sky. There were endless banquets ‘in honour of' and ‘hosted by'. A month later, the first LNG deliveries from the plant began. Japan was the first country to receive supplies. Contracts for the plant's output have been signed for the next 20 years, and 60% of it will go to Japan. Japan is not just any old neighbour for Sakhalin. It's the closest foreign country to us. Some people on Sakhalin have never been to Moscow, but have already been to Japan, though not many. Planes and ferries go between Sakhalin and Hokkaido, but tours to Japan have not proved particularly popular, even though the two regions have good relations. Several towns on Sakhalin are twinned with towns on Hokkaido. Sakhalin businesspeople work closely with Japanese businesspeople in various sectors, though every year brings its inevitable share of complications and political incidents. The Kuril islanders and Japanese organise visa-free exchanges, and the Friendship Ship travels between the islands. There were plans a decade ago to build the Russian-Japanese Friendship House on the main street of Yuzhnosakhalinsk as a symbol of friendship between Russia (Sakhalin Region) and Japan, but construction work stopped and the unfinished site graces the regional capital's main street to this day. During Dmitry Medvedev's visit a high fence was put up to hide the stone shell of the unfinished building, and it was said that the construction work would continue. But from my office I see that the president has left, the fence is still in place, and there is not the slightest sound of any construction equipment. The Russian-Japanese Friendship House is not about to open its doors anytime soon. "The right house for the friendship", people joke on the forum. If you look at things from the point of view of the territorial dispute with Japan, which dies down only to flare up again with renewed vigour, there may be some truth in this. Going back to an issue that has been dragging on for years is of course one way to avoid the issue on everyone's lips at the moment, namely the crisis. Most new and interesting things take a long time to reach the Far East and especially Sakhalin, but the crisis lost no time in coming. There was no panic, just the firm conviction that things would soon go downhill. Prices soared, especially for petrol and food. The cat litter I buy used to cost 300 roubles: it went up another 100 roubles overnight. When I asked the sales woman why the sharp increase, she said, "it's the crisis", without adding any further explanation. Medicines, nail varnish, ballpoint pens, all more expensive because of the crisis. Everyone knows this, but exactly what this crisis is all about, that they don't know. Of course, those who've lost their jobs do know what it's all about. They get some explanation for their sorry predicament - optimising costs, staff cutbacks, finance has dried up. People working at the Sakhalin offices of big companies have been particularly hard hit. These companies are reacting to the hard times by trying to maintain their head offices, and the regional offices get just enough funding so as not to close down entirely. It seems to me that this applies not only to companies, but also to support for the regions from the federal centre. People on Sakhalin are not expecting much federal money this year. I haven't been personally affected by this crisis yet, except that it has become more expensive to keep a cat. So far, my wages have not been cut (touch wood! ), and I've even acquired my first means of transport - a bicycle. The reason for my good fortune is that I work in the internet media. In their quest to optimise costs and so on, companies are looking for more profitable ways to advertise. In this respect, an internet portal with an active forum offers a well-developed interface. My friend Zhenya was not so lucky. She worked in a non-profit environmental protection organisation involved in the conservation of Pacific Ocean salmon. The Sakhalin Salmon Initiative, as this organisation was called, received money from the Wild Salmon Centre in the USA. But with the crisis, they decided that six people were enough to protect salmon on Sakhalin and Zhenya, as the newest employee, was made redundant. I recently ran into Sergei, a former fellow student, in the street. He was on his way to the job centre to register as unemployed and ‘spoil the statistics', as he put it (with a population of around 530,000, official unemployment on Sakhalin is 4%). Sergei was one of the victims of mass layoffs in the branches of one of Russia's biggest mobile phone operators. He had graduated as a journalist, but had been selling mobile phones. There are even worse cases. One acquaintance of mine recently fired his secretary. The fifth. She had forgotten to submit the necessary documentation to take part in a construction tender - an unpardonable mistake in these tough times, of course. He placed a wanted ad to hire a new secretary and stipulated that applicants should be computer literate. Today he said that a young man sent his CV: a university graduate with top marks, fluent in English, good knowledge of French and basic knowledge of Spanish and Korean, experience as a deputy director, security specialist, translator and manager, and now he's ready to type documents, answer the phone and make coffee for 14,000 roubles a month. That's around $450 - in euros a sum too horrifically small to contemplate. That's the crisis for you, Sakhalin style. Yuzhno-Sakhalinsk is the capital of Sakhalin Island. It has a population of nearly200,000 and is the administrative centre of the Sakhalin Oblast, an area which includes the Kuril Islands. It was founded in 1882 by convicts sent to the island by the Tsarist government to serve out their sentence in labour camps. The southern half of the island was ceded to Japan after Russia's defeat in the Russo-Japanese War of 1904-05. Soviet troops took it back in 1945, when it acquired its name, which means South Sakhalin City. While remaining the administrative centre, the city shows many signs of the rush for oil and gas: the presence of foreign energy companies has contributed to infrastructure developments, including the building of new hotels and residential areas.